Birds mirror some unflattering human characteristics. Before this idea gets tossed into the “ridiculous” bin, listen to what I learned from watching my bird feeder. It sits near our kitchen window for easy sightings of birds who come to munch and mingle. When they fly in to eat and socialize I wonder: could this be the inspiration of humans offering snacks or drinks to visitors? “Always have something on hand to serve in case anyone comes over” I hear my mother say. Birds arrive looking forward to the snack they’ll find at our house. Their behaviors caught my attention recently and reminded me of their human counterparts. Four stations exist around the feeder, allowing four birds to nibble at one time. Some wait patiently on tree branches for a free spot. Quite democratic, reminiscent of people on line awaiting their turns at diner counters. 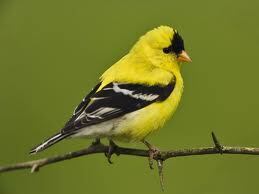 Small birds like goldfinches land on the stand, eat seeds with their bird-like appetites, (“She eats like a bird!) and fly away. They are the “Eat and Run” type of guests. 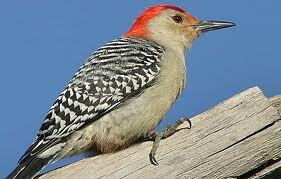 The red headed woodpecker, suspicious and hyperaware, is another who never stays to chat. 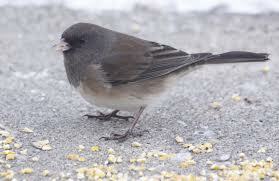 The patiently meek birds such as the juncos hop around on the ground below waiting for seeds that inevitably fall down from above. They are not looking for trouble! 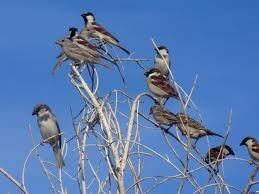 The sparrows travel in Coffee Klatches, chattering as they alight in social groups who travel together. Here comes the cardinal. Everyone notices; so beautiful and showy are his bright red feathers. His portrait appears on Christmas cards every year. Large: larger than three birds put together. More notable than his size is his personality. Mr. Cardinal is a bully. He chases other birds away from feeding spots: not only the ones next to him, but even the ones directly across from him that he cannot even see. “But you couldn’t possibly eat all these seeds yourself,” chirp the nuthatches and flickers. No matter how beautiful he is, you can’t like a guy like him. Why can’t he allow others to have their tiny portion of food? It doesn’t threaten him or limit the amount he can eat. He’s just like the aggressive person who controls his environment by insisting he wins even if he doesn’t need what he is fighting for. Who do you know who reminds you of Mr. Cardinal? I love your photos! Really beautiful. Does it take a lot of patience? Everything worth doing well takes a lot of patience. I admire Your wonderful bird photos! Thank you; ‘glad you enjoyed them. Birds brighten up the winter landscape, don’t they? I love the way you are adding images to your blogs. Thank you, Gaye. It is good hearing from you again. I can tolerate the cardinals of the world, but the blue jays are downright nasty. The cardinal frightens away the other birds and is greedy, but the blue jay chases after those birds when they flee. Such a beautifully colored bird to have such a bad attitude. He should use his beauty for more constructive uses. That rule could apply to a few other creatures besides blue jays. Oh that’s an easy one…my boss…he thinks he rules the whole roost. 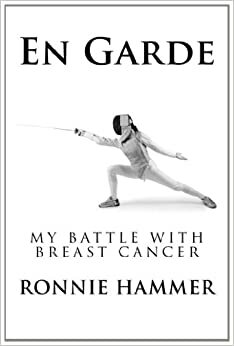 Loved the post, you have a fascinating take on life. Thanks, Jo. Those happy sounds from the nests keep you going for a while, don’t they? Your birds are great–we’re seeing more squirrels at the moment, alas. We have gray squirrels, but in places like Princeton, NJ and Larchmont, NY, the squirrels of note are the black variety. Quite striking! We have mostly gray and an occasional red. And just a couple times (in my whole life) I have seen a black squirrel–you’re right, they are spectacular! You’re right. Birds do exhibit some human characteristics that makes one pause and ponder. As much as I love to see them feed, I find some of them are a pain in the rear for others. Humans who are bullies do so for the pleasure. What a thoughtful post. It was also fun to read. Bullies are not good no matter what species they belong to. Many thanks; just watching them interact outside was too familiar to not write about how humanistic they seemed. Enjoyed that writing and the pictures, you have woven it all into a great story with their comparisons to humans. Thank you for stopping by and adding your comment. Delightful post, perfect for a cold, snowed-in Colorado day! I love your phrasing, especially gems like “sparrows travel in coffee klatches.” Wonderful. Thank you; until I started writing I never realized how many ways there are to say the same thing. Great post. 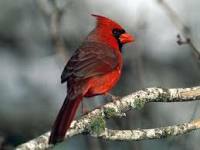 I no longer have any cardinals in my life either, having learned some hard lessons that they can be hazardous to my health. I try to stay away from those unhealthy relationships. That is an important health-saving lesson. I remember there came a point that my father refused to take phone calls from his own sister! I love this post… I have spent hours, early morning, sitting at a watering hole in one of our many game parks… with camera obviously… but more to sit and watch the interaction of the specie that visit the water hole… it always amazes me the bullying that goes on by certain bird specie… yet nature has a way of “what goes around comes around” attitude… I once watch a fairly cheeky “Indian Myna” chasing all and sundry away from a fair sized hole as though he could drink the 3000 gallons himself… a small finch came along and chased him.. I could not believe it… it was not long after, that most of the birds came back including the culprit, and this time all drank together… I am still of the opinion that some birds do this tyo get the others on edge, so that they will be more observant of possible enemies that could be lurking in the area…. I have observed birds of differing specie.. some are always looking up others around and some even down… maybe the assist each other in being watchful for the enemy bent on catching them…. You observe wild life more than anyone I know, Bulldog, and I trust your opinions about their behavior. BUT I never thought I would root for a Wildebeest! No different to the human race. Driven by greed and power. Does this mean that you and I and a few other bloggers are no longer members of the human race? I don’t know anyone like the cardinal at present. I try to stay away from toxic people. The cardinal I used to watch in Boston wasn’t so mean–at least I don’t remember him that way. Good for you; why have people in your life who cause the hackles to fly? Really? I always thought the blue jays were very aggressive too, but they don’t come here so I couldn’t watch their behavior. You are right. I checked it out. In Israel I see beautiful parrots. I thought they were migrating through but someone told me they are “pets” that got loose. They come right up to the window and it is fun to watch them. Are you in Morristown NJ? I used to live in Elizabeth and saw lots of blue jays there. Yes, I live in Morristown. Elizabeth is a bit of a hop, skip and jump from here now that the highways are open. Hey Ronnie, great, entertaining post. It does take all types to make up the diversity that keeps life interesting! There is a lot of human nature about birds and animals. I’ve seen some of this behavior between the squirrels, chipmunks and birds. Love the photos of your cute, little birds. I see far more of the birds that are 4′ tall and higher – Great Blue Heron, Sandhill Crane, Wood Stork and Egrets. Wow, Judy, your birds would have a great time visiting our Koi fish! I would NOT wish that on your fish pond. Blue Jays and crows can teach this guy a lesson. They’re tough guys: I imagine they could teach or “force feed” any lesson they wanted! That’s interesting: is that a neighborhood suggestion or a township rule? I’ve been observing the birds recently; seems like a coincidence! You still remain unique and creative. Thank you for that kind comment; I really appreciate it. Yes, this weather is feeling cold enough to see birds seeking food. They swarm at our feeder the same times each day. Very perceptive of you Ronnie in seeing the simularities between us all. Nature often reflects back to us 🙂 you have some colourful birds that come a calling. I guess we’ve all known a colouful bully at some point in our lives. As well as those shy individuals who let other walk all over them. Long may you feed the Birds. They certinly brighten up my own garden. Thanks, Sue. You are right on all counts. They brighten our garden as well, and it’s interesting to notice the different personalities they have. I love watching the birds at the feeders (we have 2 set up) and have never compared them to humans– well done– love this post! Thanks! Thank you, Lisa. It is relaxing to watch the bird feeder, but I don’t like seeing the bullies at work!